Holidays bring the best out in people, in movies, and in fashion. So why not mix all of these bests together? That’s exactly what the makeup industry has decided to do and they have been doing it with nail polishes that will make your nail art pop and dazzle just like Christmas lights on a tree. Here are the best movie inspired nail polishes you won’t want to miss out on this season. Make sure you buy yours today so you are prepared for the holiday ahead. You don’t want to get stuck in a black Friday blizzard blitz or accidentally forget someone special on your shopping list. This year there are two major movies that have taken over the nail polish industry. One is The Nutcracker and the Four Realms by Disney and the other is the NEW Grinch Who Stole Christmas cartoon movie coming to theatres near you. While The Grinch and The Nutcracker movies are classics they have gotten reboots this year that are unique and better than in the past. This has inspired nail polish companies to make colors based on these reboots. That means the companies have rebooted classic colors as well. Let’s start with The Nutcracker and The Four Realms. Not only does this movie look magical from the previews, but it features amazing actors and actresses such as Keira Knightly and Morgan Freeman. The new reboot has an amazing plot too. It follows the original story of a girl going into a mouse whole on Christmas Eve and a Nutcracker having to save her, but in this story, it’s more than a mouse hole. It’s a journey into four new Winter inspired realms of magic. Just like the four realms of magic they made quite a few colors of magical and beautiful nail polishes. Some are inspired by the soldiers clothing and some are inspired by the realms themselves as each has their own colors and themes. However, if you want to get a present for yourself or for someone you love that is Nutcracker inspired then you should really check out this mini set of polishes. It’s by OPI and costs 14.50. It comes with four distinctly different colors that are perfect for holiday nail art. The season colors are Thinker, Winker? Dreams Need Clara-fiction, March in Uniform, and Dazzling Dew Drop. 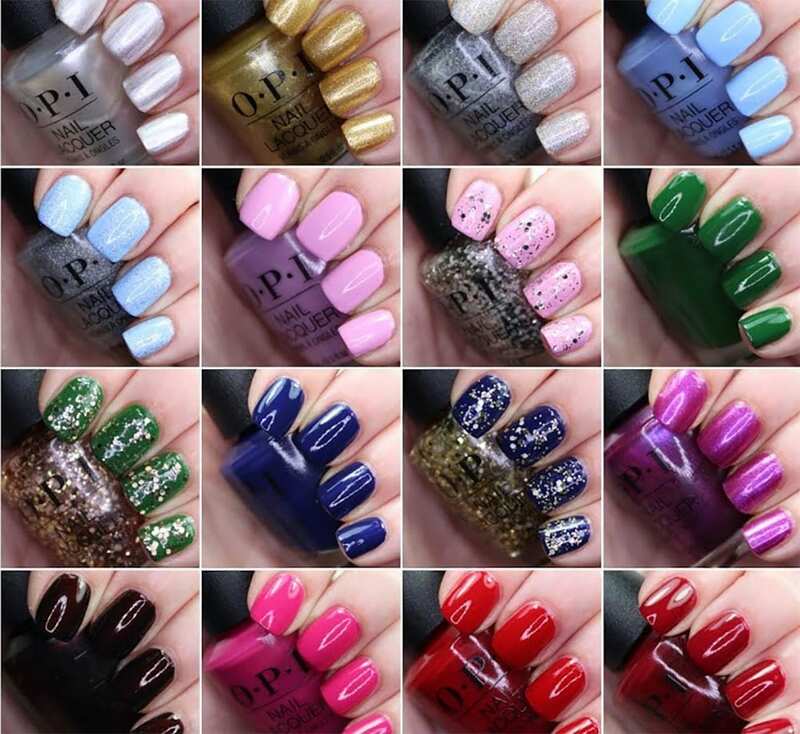 All colors by OPI are made in the USA and are of the finest quality. This particular set features blues (one light and one dark), a gold metallic color and a silver metallic color. Metallics and blues are very trendy this season. So this set really has the best of all worlds or realms. Whichever you prefer. Be sure to check out the movie and these nail polishes. China Glaze has come out with the new The Grinch nail polishes that will blow your holiday mind. If you’re a mean one then this collection might be for you, If you hate Christmas this might be for you, or if you really love Christmas even the unlovable lovable Grinch then this set is definitely for you! This collection that China Glaze has put out features 18 different and distinctly beautiful polishes. You can get yours here for 22.99. There are plenty of colors to come up with all sorts of amazing designs and styles for the holiday season. The set itself includes a color called Grinch-worthy which is a sparkly metallic green. A Christmas color you need and a metallic style that goes along with this seasons trends. Then there is Resting Grinch Face that is a greenish blue or if you’re in a need of a good red shade there is Ho Ho No! All of the colors in this collection are delightfully Grinchy with their colors and their names. You’re a Mean One is my favorite though. Not only is the name perfect for the season and The Grinch, but it’s a gorgeous dark purple color that resembles royal purple. You’re a Mean One also has a metallic sheen to it that you normally don’t find with deep dark purples. It’s gorgeous and you need it. Just don’t forget to spread some holiday cheer instead of humbugs. Even if you’re Grinching out in the nail department you still need to throw in some Whosville holiday spirit. Overall, OPI and China Glaze are excellent companies for quality products. I hope that you are inspired this holiday season and enjoy using or gifting these amazing items. Also, be sure to check out the movies that correlate with them. They are supposed to be some of the best movies of the year. At the very least they will bring you some holiday cheer. Oh, and remember to, as always, have a wonderful holiday season with family and friends.